Bake chicken patty according to package and/or case directions. Overcooking will cause the patty to become dry. Place bread in freezer prior to cutting into cubes to make cutting bread into cubes easier. Cut each slice of bread 4 x 4. Place cut bread cubes onto a sheet pan sprayed with butter flavored pan release spray. Spray cubes with butter flavored pan release spray and sprinkle with Italian spice blend. Mix gently to incorporate seasoning. Toast in a preheated low-heat oven 325° F for approximately 30-45 minutes. Bread cubes should be dried out but not burned. Place 3 cherry or 6 grape tomatoes in right top corner of salad tray. Cut each chicken patty in strips and place in center of salad. Weigh 1 ounce of croutons to determine volume measure. Place croutons in top left hand corner. Sprinkle ½ ounce of parmesan cheese on each salad and garnish with 2 red onion rings. Parmesan cheese may be served in a 1 ounce container to avoid dairy allergy concerns. Place 1½ ounce packet of ranch dressing in bottom right corner. Portion 1 salad for each serving. Each portion provides 2½ oz. eq meat/meat alternate, 1 oz. eq. whole grain, ½ cup dark green vegetable, ¼ cup red/orange vegetable, and ½ cup other vegetable. Parmesan cheese may be served on the side (see picture below for an example). 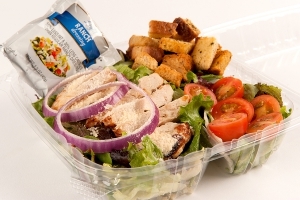 Presentation Idea: A container allowing space for the salad, croutons and dressing is recommended. Clear plastic lid for eye appeal is preferable. Do not refrigerate croutons. When salad is ready for service, croutons should be placed in container. 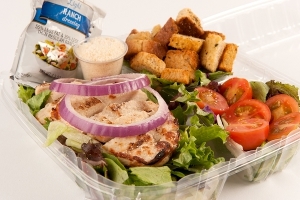 1 serving with Ranch Chicken Salad. 1 serving of Ranch Chicken Salad with parmesan cheese on the side.